The AlphaDog is growing up so fast! OK, the robotic “pack mule” from DARPA and Boston Dynamics is still approximately the same size. But its capabilities have improved markedly since we introduced you to a prototype in October 2011. Then, the machine—intended to carry up to 400 pounds over rough terrain, while also serving as a power source for troops—was stuck on an inside track, connected to heavy cables. 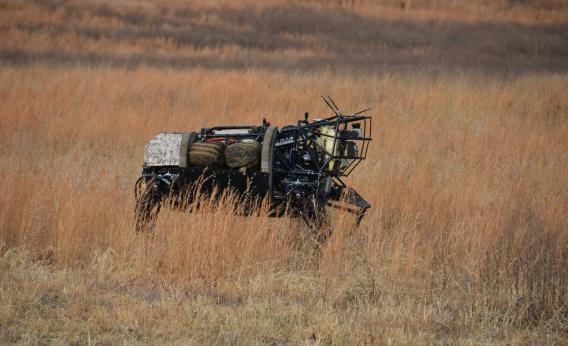 In this latest video from DARPA, filmed recently in central Virginia, it marches through the forest, responds to about 10 verbal commands, and follows its leader closely. Rough terrain like ditches isn’t a problem for the hearty man-made beast, and when it rolls down a hill, it recovers smoothly. On flat land, its trot is impressive, too. It isn’t exactly ready for stealthy missions: The whirrs and whines sound like a blender. But at this rate, AlphaDog—or, as it’s also known, the Legged Squad Support System—will be stalking the woods silently before you know it.